I’ve been working a little with extended properties, adding and updating them for various objects. However in addition to altering properties, viewing the properties on an object is often necessary. This post will look at how we get the properties in a few different ways. 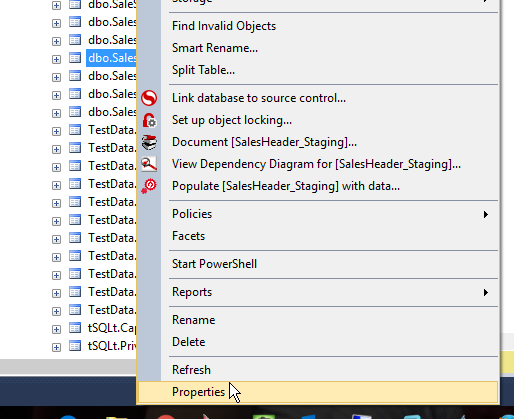 The easiest way to see extended properties is to look at the properties of an object in the SSMS Object Explorer. For example, I can right click on a table in OE. header with owner, type, and creation date. Messages with index, constraint, FK, and schemabinding relations. Not very helpful in this case. I do know that extended property information is in sys.extended_properties. I can query this view, which gives me some information, but I need to join this with sys.objects for easy to understand information. This works, and this is one of the ways in which I do query properties in various tSQLt tests. There is one other way I’ve seen to query extended properties. When perusing the BOL page for sp_updateextendedproperty, I found sys.fn_listextendedpropery. This is a DMF, a function, that you can use to query for property values. Since it’s a TVF function, I need to use it in a query as a functional object. There are lots of parameters in this function. However you can guess what they are after working with the other extended property procedures. In fact, the first time I started this post, I was disconnected and had to experiment with the function, adding parameters until it ran without an error. The first parameter is the name of the property. This can be NULL, in which case you’ll get all the properties that exist. The rest of the properties correspond to the level 0, 1, 2 types and names that you are using to filter the results. This is actually a good technique to use with this function, and I’ll be using this more in the future. This post followed on from the previous ones. In this case, I started this disconnected, using the knowledge I had to write the basics with SSMS and the system table. That took about 20 minutes to document and then I spent 5 minutes experimenting with the function, whose name I had on an open browser tab. Once I worked through that, I spent another 5 minutes writing. Thirty minutes to a post. You can do this.